Last week we revealed the first room in our Mulholland Drive Project featuring this California Eclectic Living Room. As promised, this project gets better and better with each space. Today, we’re revealing the formal living room. It’s both modern and bohemian, while still feeling polished enough to be the formal dining area. We started by anchoring the space with this gorgeous rug from McGee & Co. It’s deep saturated color palette flows seamlessly with the wood floors that have a cool gray undertone. While the dining table is available to the trade only (contact us here if you’re looking for full-service design services), we found this similar version that would work perfectly in the room. The key to this piece is the chunkiness of the clean lined legs. Paired with these cult favorite dining chairs, the space is instantly brightened up and incredibly comfortable to sit in. As always, our #1 priority in any space is function. At the heads of the table, these Indigo Dining Chairs add a pop of color and our signature boho style. We added this modern glass chandelier to reflect light while keeping the geometric feel of the room. The space has gorgeous natural light, which we highlighted with a simple matte black drapery rod. These linen/cotton blend drapes are some of our favorite window treatments and we’ve used them in many other projects. Opposite of the windows, we created a functional dining buffet. This two-tiered console table works perfectly as a serving area and will transition to so many other spaces. For additional seating, we even tucked these textural stools under the consoles (perfect for kids!). To style the space, we focused on adding interest with varying heights and natural materials. These ceramic vases are perfect for swapping branches throughout the seasons. This wood bowl is the perfect centerpiece and can hold a pop of color with fresh citrus when paired with this pretty white pitcher. Add a final pop of color with this geometric vase stacked on top of your favorite coffee table books. 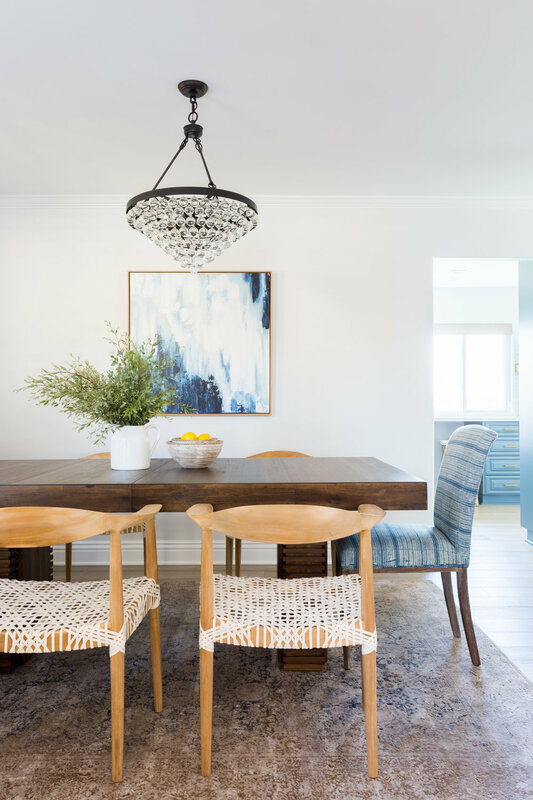 Scroll down to Get the Look of this Modern Boho Dining Room. All sources (or similar) are linked down below. For other dining room inspiration, check out our Lake Sherwood Project here. If you missed the living room reveal last week, catch up here. Don’t worry - we’ve got more goodness coming your way next week. PS - if you’re at High Point Market this week, come find me!